As it is January I bet many of you, like me, are once again promising that THIS will be the year to get fit. Considering joining a gym? Wondering how many times a week you will plan to go versus how many times a week you will ACTUALLY go? Yep. Been there before too. I know from experience that joining a gym is utterly impractical for both me and my family. There simply just aren’t enough hours in the day. To be perfectly honest even before we had kids I would rarely ever go often enough to justify the monthly membership fees. Finding time to exercise is hard. We all know this, and the latest exercise DVD from Davina has been designed with exactly that in mind. 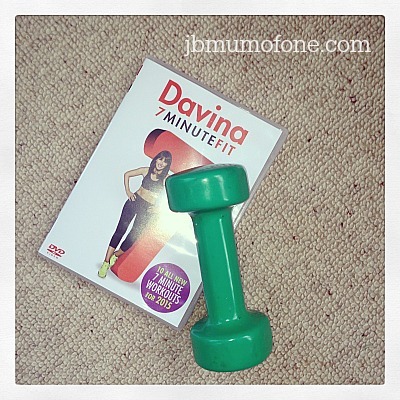 I have been sent two copies of Davina 7 minute fit. One to try out for myself, yay, and one to give to one of you lucky readers. It consists of a short warm up, a dynamic stretch and cool-down workout and eight specific workouts that are just seven minutes long. If you are new to exercise don’t panic, there are also clear tutorials which will take you through how to do some of the more complicated moves safely. There is also a fitness challenge to be done each week so you can track your progress and see how much you have improved. For beginners, you can start with just one workout each day. I know this doesn’t sound like a lot but 7 minutes every day is better than just half an hour once a week right? For those looking for more of a challenge it is easy to put together a combination of workouts for a more thorough workout. This morning I had a bit of time and managed a combination of four routines and now feel great…and just a little smug. Sorry. Once you receive your DVD you can then log in to Davina’s new website, GetFitWithDavina.com, where you can register to receive your own, personalised, combined exercise and nutrition programme which is free for the first five weeks. To continue it then costs £4.99 per month. I registered this morning and will update you with more details once I am up and running. So, who is with me? Fancy giving it a whirl? To win a copy simply tell me in the comments below your own fitness goal this year AND enter via the rafflecopter. Me…I’m still dreaming of that six pack…and being a stone lighter. Gotta aim high, no? Bonus entries can be gained in the usual ways. Good luck! This prize draw has been featured on Prizefinder UK, Competition Hunter and Di Coke’s Super Lucky Blog. To loose a stone and tone up this baby belly!!! Its been 2 yrs!!!! I want to put on a little weight and tone up. I want to shift the baby weight and get fitter! To be able to do situps! To try and get and stay fit, eat healthy, not getting any younger. To tone up and be less flabby!! Would love a workout with Davina – need to get rid of xmas belly! I just want to get back into running. It really helps my mood and would make me a better wife and mother. Loose some baby weight and just have more energy. to lose 2 stone and become stronger. To lose a stone in weight by the summer! To lose 2 stone,get fit,healthy and toned and to do the Great North Run in September.6 pounds down in my first week,so a new dvd to keep me motivated and challenged would be brilliant. I want to loose a stone and tone up! To walk at least 10,000 steps every day. I’ve started my Pilate’s again to improve my posture! To lose weight for my wedding! I want to lose a few pounds and tone up. I would like to lose 3.5 stone to get back to a sensible weight but I would also like to increase my muscle tone. To cut out sugar and start running. I have a Fitbit Flex and the Zombies, Run! Android app to help out. I would love to tone up and gain some stamina! I want to build up to cycling day trips of about 50 miles during the summer. Last year was a bit hectic so I got out of the habit and think it would kill me now but really enjoy it so want to get back to it. To consistently exercise at least four times per week! I would like to be able to run at a good pace for about 45min to 1hr. I want to get back to using my exercise bike. I had a knee op 3 years ago which has left me unable to walk properly which in turn has damaged my back. But I’m getting injections to sort that in the next couple of weeks so want to get back ion my bike! To lose two stone and get fit & healthy. To get back into exercise – I’ve made a start. I want to pluck up the guts to start going jogging without feeling self conscious! To lose my baby weight. I have no excuses now that Christmas is over. To get a bikini body before I have a family holiday with all my in-laws. Not been in a bikini for 7 years!!!! I need some help and motivation to lose 2 stone! To walk instead of getting the bus everywhere. To improve muscle tone of my abdomen. Had surgery a few months ago, and wonder if that had an impact. Also Christmas and New Year may have added a few pounds, don’t want to weigh self. Would rather try to become more active, and eat healthily and be aware of clothing size :- fit, comfort etc.It is always nice to feel comfortable, stylish etc in an outfit. To maintain my fitness levels. To finally become what I call a ‘proper runner’! To lose 10lbs, have less migraines and start running. To get back out running and manage another 1/2 Marathon! put on more than half a stone, eat better, and be fit! To tone up and have a flat (or at least flatter) tum and get rid of the muffin top! i wwant to reach my ideal weight this year! Currently doing Slimming World and managed to lose 3 stone just by addressing eating habits. Now need to tone up and start doing the exercise!! To keep doing stomach crunches to get my belly flat ! To lose weight and firm up my flabby bottom! We both need to loose some weight. to wear a bikini on holiday! To improve my fitness and loose weight for my sisters wedding. Oooh I’ve heard Davina’s workouts are really good. It’s on my 2015 goals to tone up and get fitter in general so this would be perfect. I have stopped smoking after a stressful year – I have your other DVDs which I have loved but think a 7 min a day is very do able!! To go for a daily walk or use my exercise bike if the weather is bad. I really need to lose at least half a stone. To start getting my body back after having a baby and try and get rid of c-sec tummy! To tone up for my wedding! My second baby is due in March so my aim to to lose the baby weight by the time I go back to work next January. To lose a stone, maybe a stone and a half. And tone up. I would like to be able to squat about 50kg – a bit ambitious but i am working on it! to get back into any shape that isn’t quite as round. To be able to get into most of the clothes in my wardrobe again! Loose a stone and a half!! To stop looking haggard with a side order of flab – summer is a coming in! This year i’d like to compete in my first 10k run. To go swimming twice a week and eat more healthily! To get into a good dog walking routine so that there’s time to go on a long walk and have a run around together, I’m already getting fitter! I want to get back to a size 10 and improve my lung capacity! I want to walk a lot more and maybe even build up to running. I’ve recently taken up yofa. To do more exercise to feel more healthy and refreshed. To train hard so I can compete in the mud runs I have signed up for. To improve the speed and distance that I can run … I’m up to running 8 miles (but not comfortably) and by the summer I want to be able to run 13 miles (half marathon distance), not necessarily comfortably, but without doing myself a damage! To tone up my body and start running. To be fitter than last year and hopefully lose a stone! To lose weight so I can look nice in my bikini on holiday in May – was horrified when I saw photos of me on the beach last time! My fitness goals are to focus and do more of what i can do, rather than focus on and use what can’t do due to a chronic foot condition as an excuse! To be able to run 10k by April! I want to lose several stones but am taking it in small steps and have set myself a target of 1 stone by the end of February! The usual – to lose weight and get fit ! as so many have said, to lose some weight and get fitter but keeping the expectations low – one step at a time. I have only done minimal exercise since my youngest was born…3 years ago! I’d really like to remedy that and get into better shape. I want to lose 9lbs, this is the weight that I have put on over last year so want to get back to where I was before. To get fitter & to quit smoking! I have purchased a juicer and a blender this week as I hope to become a lot healthier this year by drinking vegetable juices and fruit smoothies. Lose weight (a few stones). To just do more exercise! To keep going and don’t fall into a malaise of bad habits! Lose weight and up my fitness levels. I have a lot to lose and am doing well so far, 11lb off so far in January so am thrilled! To lose quite a lot of weight to get my PCOS in control! Improve my fitness levels and do more exercise. Tone up and get fit! I want to get back into fitness DVDs at least three times a week. To hopefully loose some weight. To become toned and fitter! To lose more weight, 2.5 stone down, 3 more to go! Get rid of the bingo wings! To keep going to the gym regularly and to get toned up. To get back to pre children weight of 9 st. I have a stone to go. Have already started taking steps towards it no more ready meals, drinking more water and 2 fitness classes a week. I’ve been losing weight due to an unknown health issue, so I’d like to keep that weight off when I’m recovered from the health issue, and to also start eating much more healthily this year – get more fruit and veg down me and in general improve my diet. To stop smoking and lose 2 stone! I plan on starting bootcamp twice a week to get some fitness, eat clean and lose weight! I want to fit and healthy again and I’ve got quite a bit of weight to lose. To become my fittest, strongest and healthiest yet. I want to be able to squat my own body weight by 2016! To lose a bit of weight, give up diet coke and eat healthier. I think i want to be realistic – i’d just like to make a goal each week to have completed two hours of exercise. Just to get off my bum and do something! I would like to lose another 3 stone. I have lost 2 so far and I am starting to get bored using the treadmill for fitness so it would be good to have something new to try! I’m trying to go on my exercise bike 4 days a week for half an hour each time to increase my general fitness levels, kept it up all of January! It was to go jogging three times a week…..lasted about 3 weeks! Tone up my belly and arms!!! To tone up and get some regular exercise! Making it to December 31st would be good. See what else I can manage en route. I’ve lost just over 3stone so now I need to tone my to get to my ultimate body shape. To lose weight and tone up so I can go wedding dress shopping as I get married next year. To shift the baby weight! to actually do some exercise! Just need to lose around 1 stone in weight & tone up. I am cutting down portions and cutting out fat to lose a stone. To get rid of my mum tum! I need to tone up for my wedding in April and then stay that way! Lose weight and tone up. I have my sister’s wedding this year and I want to be able to be happy with how I look in the photos. Get back into shape after having a baby! My 2nd baby is due at the end of February & i’m really looking forward to getting my body back again! I want to improve my muscle tone that has been lost due to my MS and fatigue. Would be great to tighten up my tummy since my youngest is nearly 4 now. To be able to run a further distance. To flatten the beer belly and tighten up everywhere else.